Rapper Dragon cemented his BMW Hong Kong Derby claims and raised the prospect of a first ever Four-Year-Old Classic Series clean sweep with an authoritative victory in the Hong Kong Classic Cup this afternoon, Sunday, 19 February. 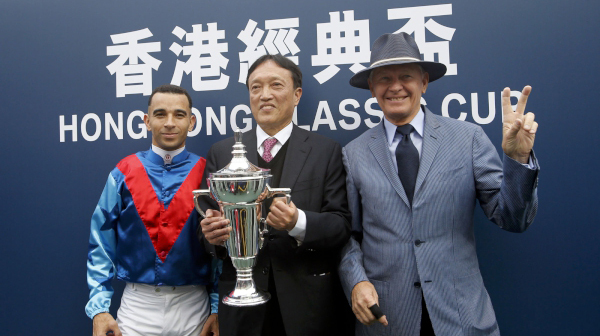 Joao Moreira partners the John Moore -trained Rapper Dragon to victory in the Hong Kong Classic Cup (1800m) at Sha Tin Racecourse today. John Moore’s charge added to last month’s impressive Hong Kong Classic Mile success with a smooth length and a half win under Joao Moreira. The Australian-bred held the late, wide-track charge of Pakistan Star to join Floral Pegasus (2007) and Sun Jewellery (2016) as only the third horse to have claimed the series’ first two legs. “The way he won today was pretty much the same as the first leg,” Moreira said after the Street Boss gelding had clocked 1m 46.98s for the 1800m feature, the fastest at the course and distance this season and a race record too. The Joao Moreira-ridden Rapper Dragon (No. 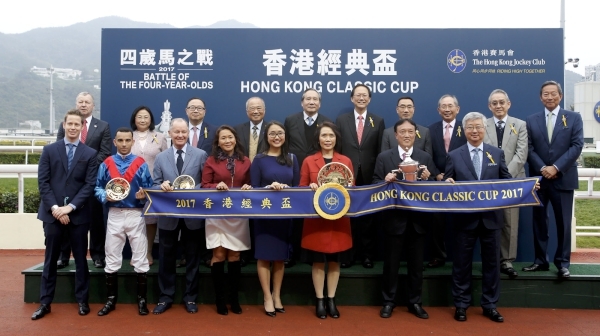 1), trained by John Moore, wins the Hong Kong Classic Cup (1800m), second leg of the Hong Kong Four-Year-Old Series, at Sha Tin Racecourse today. 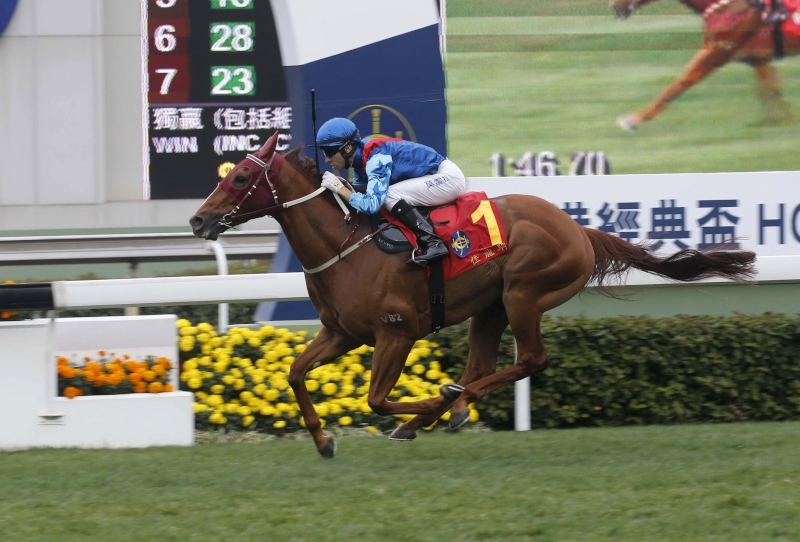 The manner of Rapper Dragon’s triumph had jockey and trainer brimming with confidence post-race, both believing that the chestnut can clean up with a historic BMW Hong Kong Derby (2000m) win on 19 March. The champion jockey settled Rapper Dragon mid-division, one spot from the rail, as Winner’s Way charged to an early lead and stretched the 13-runner field with quick fractions in front. As the challengers queued up on the turn for home, Moreira eased his mount six deep for clear progress and requested a race-winning effort. Rapper Dragon responded with a decisive acceleration that carried him to the lead 200m out, and, with the tiring front rank having dropped away, it was left to Pakistan Star to mount an eye-catching albeit vain pursuit. Club Stewards and CEO Winfried Engelbrecht-Bresges with the connections of Hong Kong Classic Cup winner Rapper Dragon at the presentation ceremony. Connections share their happiness with media following the success of Rapper Dragon in the Hong Kong Classic Cup. “He’s a very good horse, I’d said that before, and we had no doubts about him getting the extra 200 metres today, he drew the gun gate (4),” Moore said. “There was quite a lot of speed early, which was a big surprise, but he was the top-rated horse (114). The 1.7 jolly became the first favourite to win the Classic Cup since Floral Pegasus. The latter came closer to completing the treble than any horse before or since when, in 2007, the Tony Cruz-trained galloper was edged out by a nose. Cruz will be hoping that Pakistan Star can spoil Rapper Dragon’s Derby party this time around. The Shamardal gelding once again showed one of those bursts of brilliance that has captured the attention of racing fans. Dropped in at the tail, the Hong Kong International Sale graduate powered home down centre-track to take second, his final 400m split being 22.08s. Rapper Dragon posted the next swiftest closing split at 22.42s. The Danny Shum-trained Seasons Bloom, runner-up to Rapper Dragon in the Classic Mile last time, ran another admirable race to claim third, a further length and a half back. Nash Rawiller’s mount endured a rough passage back in the field, penned on the fence and buffeted by Dinozzo in the early to middle stages. Moore, meanwhile, was pleased to see Eagle Way continue his progression towards the BMW Hong Kong Derby with a solid fourth. The G1 Queensland Derby (2400m) winner ran on for late gains under Tommy Berry to finish three and a half lengths fourth. Moreira wrapped up a double on the 10-race card when the John Size-trained Nothingilikemore laid an early marker for the 2018 Hong Kong Derby. The three-year-old made it two wins from two with a five-length romp in the last, the Class 3 Tak Ku Ling Handicap (1400m). And with the Moore-trained Booming Delight and the Peter Ho-trained Limitless also winning this afternoon – franking last season’s Britannia form from Royal Ascot – Rapper Dragon could have a couple of new opponents to contend with in next month’s Classic Series finale. Hong Kong racing resumes at Happy Valley on Wednesday, 22 February.